Hotels on the beach and affordable hostels are scattered through the Los Angeles area, and whatever your field trip budget may be, you will be sure to find a suitable lodging place for your students. Arguably the most important part of planning any student trip is making appropriate housing accommodations. You could organize the most enjoyable trip, encompassing grand tours and sightseeing, the best dining arrangements and stress-free traveling. However, if you fail to make proper hotel reservations, your students and chaperones will be left without housing lodgings for the duration of your trip. Therefore, it is vital to carefully schedule where you will be staying for any trip. With that, here are our top five accommodation options for students in LA. If you’re hoping to squeeze in a quick tour of the beautiful University of California, Los Angeles (UCLA) campus before heading home, the Hotel Angeleno is the place for you. Located roughly 30 minutes from downtown LA and three minutes from UCLA, the hotel is a great lodging place for student groups who want to remain close to downtown and the college scene. The hotel provides free standard WiFi for all guests, along with 24-hour room service and in-room dining. There is also a complimentary pool and fitness center, open 8 a.m. to 10 p.m. and 5 a.m. to 11 p.m. respectively, perfect for squeezing in some group bonding time. Additionally, there is a business center open daily with MAC computers and access to a printer and fax machine, so if you’ve forgotten a laptop or need to finish a last minute assignment, there is little need to worry. Hotel Angeleno also provides hotel specials and discounts to visitors of UCLA, and a shuttle to the UCLA campus. Reservations can be made on the hotel website. 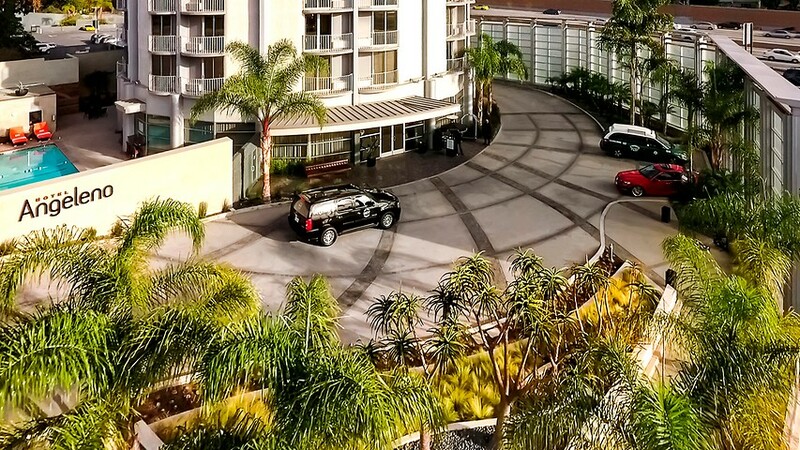 Situated approximately 30 minutes from downtown LA and the University of Southern California (USC), the Farmer’s Daughter Hotel is an exceptional alternative to pricier hotels and offers several amenities for an enjoyable stay. Just some hotel amenities are: room service, an outdoor swimming pool, daily front desk service, restaurant and room services and wireless Internet. Room amenities also cover: WiFi and premium TV channels, in-room dining, roll-away beds upon request, housekeeping and air conditioning. The hotel’s modern furnishing offers a window into the future, but still preserves the history of the past with its solid foundation. There are also different room sizes to accommodate different group sizes, ranging from the Farmer’s Suite to the Tack Rooms, the smallest type of room to the largest respectively. 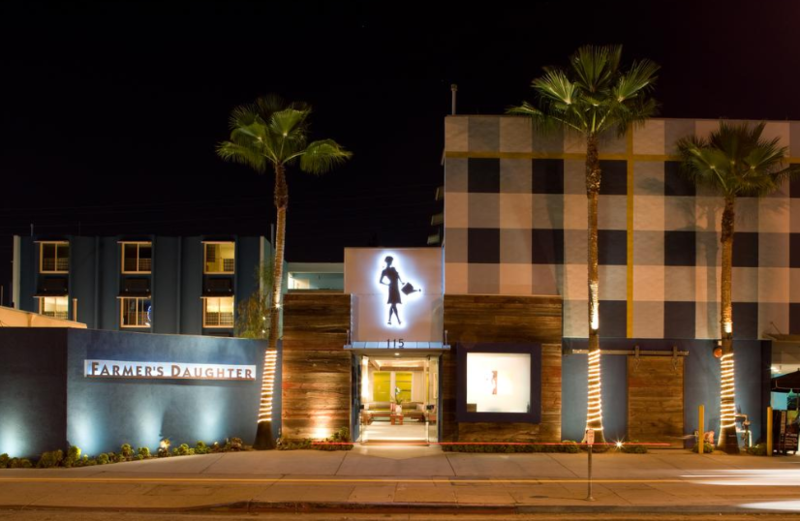 The Farmer’s Daughter Hotel is within close proximity of entertaining attractions such as the Grove, LA County Museum of Art, LA Museum of the Holocaust and Melrose Shopping District, so students will have a plethora of activities to partake in. Reservations can be made at (800) 334-1658. 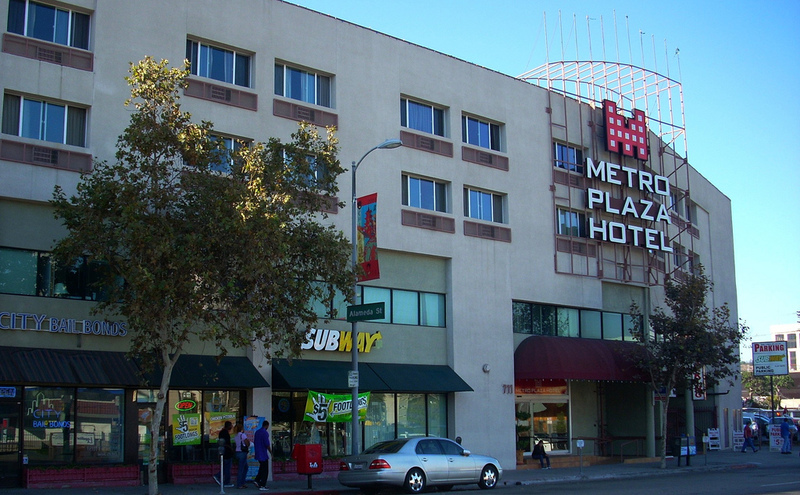 Located just one mile from the Walt Disney Concert Hall, two miles from Dodger Stadium and 8 minutes by foot from Union Station, the Metro Plaza Hotel offers spacious rooms equipped with free WiFi, cable TV, a refrigerator, a flat screen television, private bathrooms and complimentary toiletries. Among the 80 air-conditioned rooms to choose from, there are two types of rooms, where the larger of the two can hold four people. Roll-away beds are provided upon request, with a charge of $10 per night. A stopover at the hotel puts you in the heart of LA, in the center of a number of activities to choose from. Just a few appealing options to visit are: Los Angeles City Hall, the Cathedral of Our Lady of the Angels or the Los Angeles’ Children’s Museum. After a busy day of touring, students can retreat to the hotel to the spacious common area to watch TV, or they can keep up the day’s energy by finishing the night with a quick workout in the fitness center. However you choose to do in your downtime, the Metro Plaza Hotel makes several fun options available. 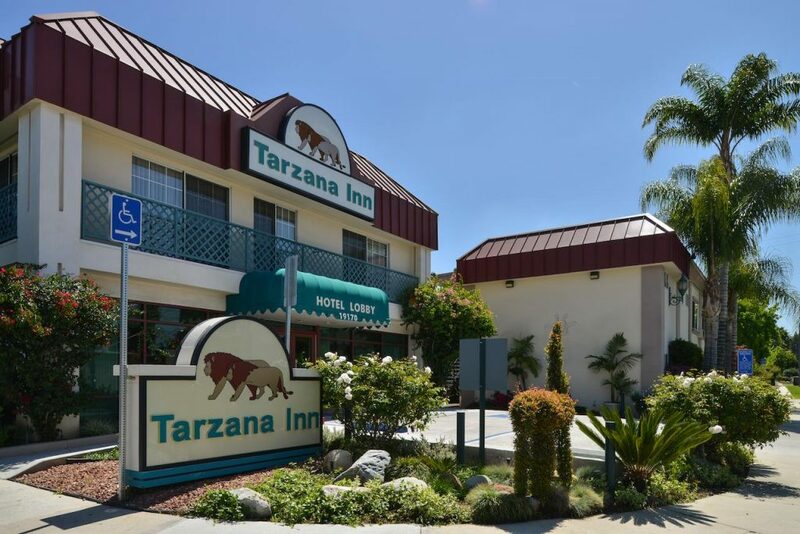 Tarzana Inn in Tarzana, CA is perfect for students on a budget and within 10 miles of the Getty Center and 13 miles from Universal Studios Hollywood. A few facilities that can be found at the hotel are: free WiFi in all areas, continental breakfast, newly renovated rooms, free public parking surrounding the grounds, 24-hour front desk service and an outdoor pool. Staying in Tarzana will give your students the opportunity to experience the history of the town, and to be within close range of several other fun attractions. You can visit the Los Angeles Zoo or Universal Studios Hollywood, and even take a drive down Ventura Boulevard. There are numerous dining options surrounding the hotel as well, with a variety of cafes, upscale restaurants and fast food joints to choose from. Once your students are finished watching a performance at the nearby Hollywood Bowl or are tired from their long days touring the closeby NBC Studios, the Tarzana Inn is a superb lodging place to return to get a night’s rest before the next day’s festivities. 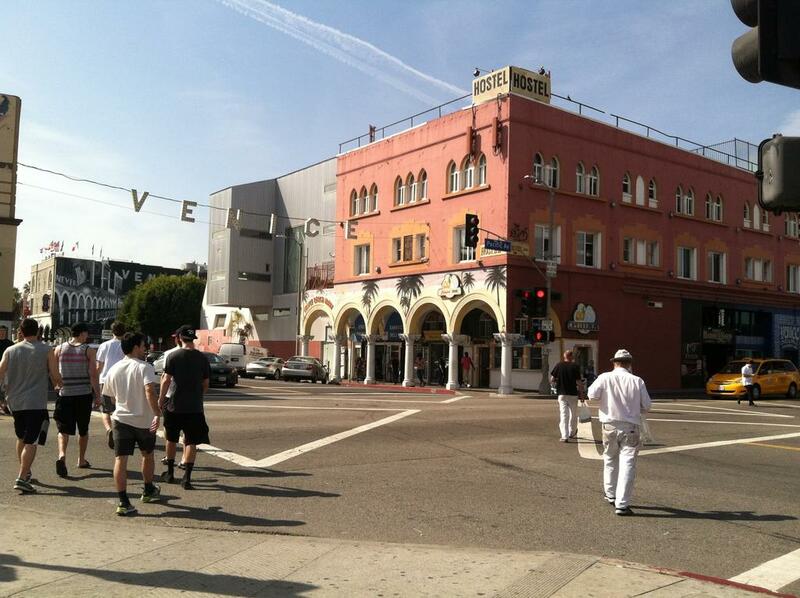 Ideal for large student groups on a budget but still longing to enjoy LA’s gorgeous beaches, Venice Beach Hostel is a more than appropriate fit for you. Just some of the several amenities that the hostel grants access to are: free computers and WiFi, free breakfast, bathrooms in every room, a pool table, full kitchen, TV room and a laundry room. Situated right on the beach, there are buses available that run from the hostel to Hollywood, UCLA and other LA locations, and you may check in at any time. Shared rooms may house up to six guests, and by each bed has a shelf, reading light and a power outlet. There are also curtains between beds to ensure more privacy. Apartment-style private rooms are available, furnished with a lounge and private bathroom, along with dorms that have bunk beds. In addition, there is a large common space ideal for bonding after a choir or band concert, where students can play board games or just relax after a long day. Some activities that you can enjoy right on Venice Beach include: surfing and swimming in the warm waters, biking and strolling along the boardwalk, scanning the farmer’s market and skating at the skatepark. Also, there are many restaurants, ATMs, a pharmacy and public transportation surrounding the hotel. More information about reservations and rates can be found on the hostel website.